The Tigers take to the outdoor track for the third time this weekend at the annual Florida Relays in Gainesville, Florida. Clemson is coming off its second meet of the 2019 outdoor season – the UNF Spring Break Invitational – which saw a number of program top-10 marks, particularly among the throws. 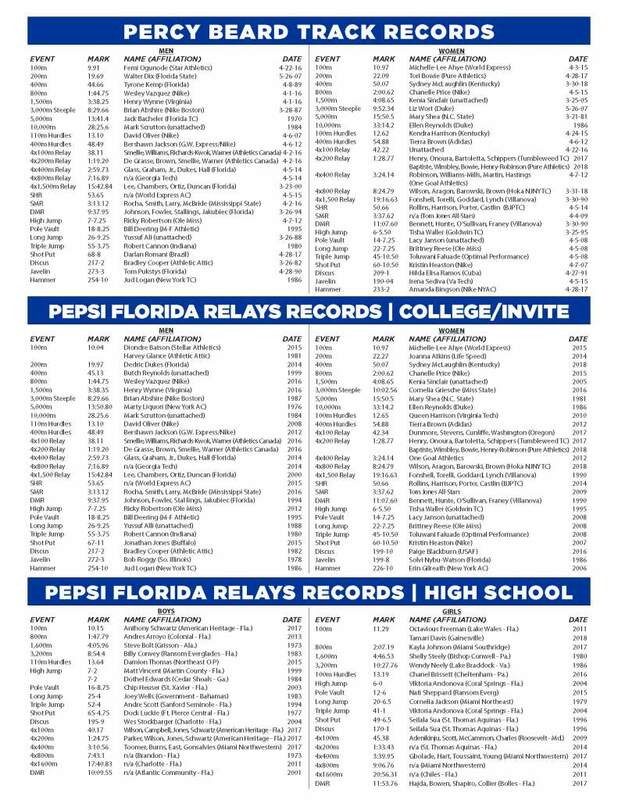 Both 4x100m relay teams will look to build upon their season bests, which they achieved at last weekend’s UNF Spring Break Invite. The men’s 4x100m consisting of Marcus Parker, Fabian Hewitt, Alex Sands and Deonte Tolbert posted Clemson’s fastest time (39.77) since 2015 to place first overall. The women’s 4x100m relay, which featured Sarah Hill Rebekah Smith, Aliyah Mallard and Zeniyah Lawrence combined to run 44.32 seconds and was the top collegiate group. Clemson’s 4x400m relay teams are slated for their second opportunity of the season after pulling out of last weekend’s race, which was running behind schedule. The Tigers ran their first outdoor 4x400m at Georgia Tech’s Yellow Jacket Invitational in cold conditions. Junior Ebony Williams leads both the men’s and women’s teams at No. 3 in the NCAA in the 100mH. Williams clocked a personal best 13.24 – Clemson’s best performance in the event since 2015 – to elevate from No. 9 to No. 8. Clemson currently holds three top times/marks in the ACC on the men’s side. Deonte Tolbert (46.92) leads all competitors in the 400m, while John Ward (15:24.39) currently ranks first in the 5,000m. Both Roje Stona (58.06m/190-6) and Grant Voeks (52.35m/171-9) currently rank 1-2 in the discus. 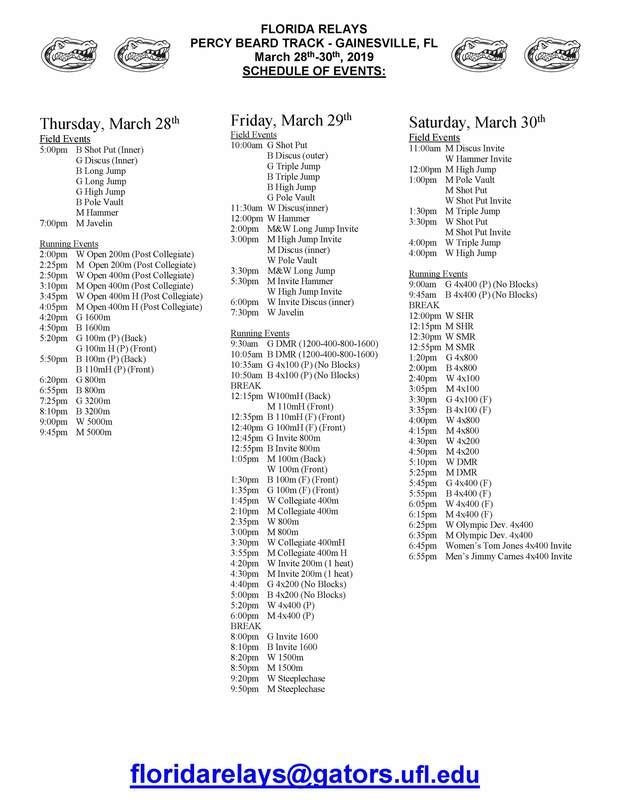 SEC Network + will pick up coverage Friday and Saturday of the Florida Relays. Friday’s broadcast is set to air from 1 p.m. through 5 p.m. and 2:30 p.m. to 7:15 p.m. on Saturday. 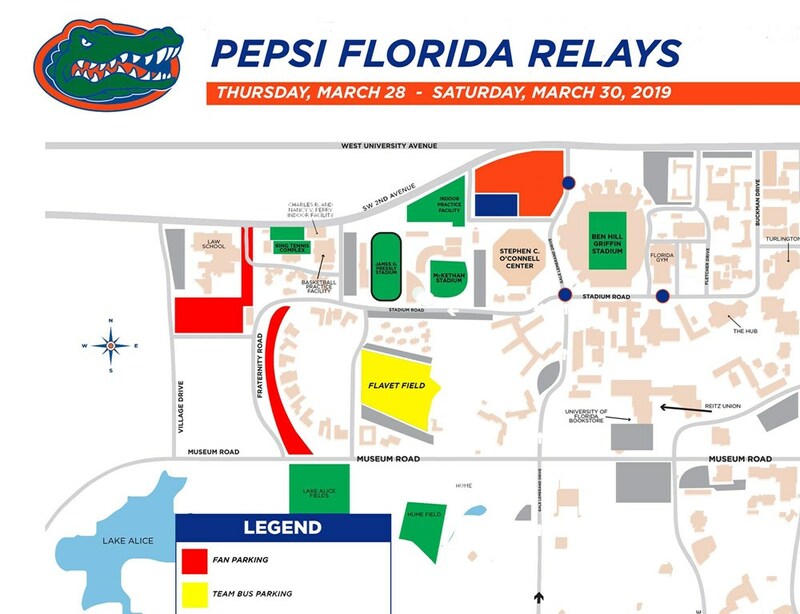 Spectator parking is complimentary and will be available at the UF Law School (GREEN LOTS ONLY Thursday and Friday [Orange Lots open AFTER 3:30 p.m.]; all lots Saturday) and fraternity row. Friday and Saturday from 4:30 p.m. through one hour after the conclusion of the Florida-Alabama baseball game, a complimentary shuttle will pick up fans parked at Garage IX (9) on the corner of Archer Road and Gale Lemerand Drive. The shuttle drops off at the right field baseball ticket office.